Aromasin (Exemestane) is officially classified as a steroidal Suicide Aromatase Inhibitor and carries the ability to inhibit the aromatase enzyme, which is responsible for the production or conversion of testosterone to estrogen. Aromasin has the ability to block aromatization, which in turn inhibits the production of estrogen, and thereby lowers the bodys serum estrogen levels. This will prove useful to breast cancer patients as breast cancer often feeds off the estrogen hormone. 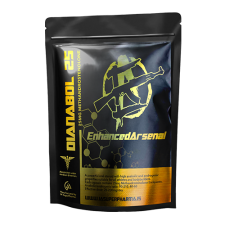 It will also prove useful to the anabolic steroid user to minimize the effects of testosterone aromatization. Many anabolic steroids have the ability to increase estrogen levels due to the aromatase process, specifically the conversion of testosterone to estrogen. This can lead to gynecomastia and water retention. Excess water retention can also promote high blood pressure when it becomes severe. Steroids that do not carry a strong estrogenic nature can also cause these effects, most notably gynecomastia if they carry a progestin nature. A prime example would be Nandrolone, which while it aromatizes only does so at 20% the rate of testosterone. However, it also carries a strong progestin nature, and progesterone has been well noted for carrying the ability to stimulate the estrogenic mechanism in the mammary tissue. By administering Aromasin during the use of anabolic steroids, this will inhibit the aromatase process, lower estrogen levels and protect the individual from estrogenic side effects. Aromasin 12.5mg has 60 capsules per pouch. Aromasin also has the ability to stimulate natural testosterone production, which is precisely why some will include it during their PCT. Like Arimidex and Letrozole, Aromasin will stimulate the pituitary to release more Luteinizing Hormone (LH) and Follicle Stimulating Hormone (FSH), two hormones essential to natural testosterone production. While the other common AIs share this trait, Aromasin has been shown to carry a slight androgenic effect, as well as the ability to increase the production of Insulin-Like Growth Factor-1 (IGF-1). This is a trait no other AI can claim to carry. 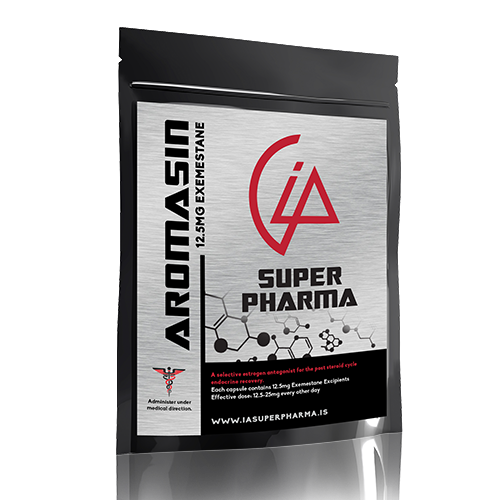 By using Aromasin during PCT, the individual receives the desired testosterone boost necessary for recovery, but with the IGF-1 increase also creates a stronger anabolic atmosphere. 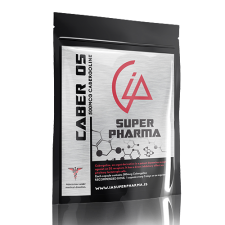 This is deemed useful by some steroid users as it could potentially give them the ability to protect their lean tissue all the more during use. However, when we look at the direct effects of Aromasin as it pertains to PCT, we will find PCT use is normally not recommended despite these positive effects. Aromasin (Exemestane) is officially classified as a steroidal suicide Aromatase Inhibitor, and carries the ability to inhibit the aromatase enzyme, which is responsible for the production or conversion of testosterone to estrogen. Aromasin has the ability to block aromatization, which in turn inhibits the production of estrogen, and thereby lowers the bodys serum estrogen levels. This will prove useful to breast cancer patients as breast cancer often feeds off the estrogen hormone. It will also prove useful to the anabolic steroid user. Many anabolic steroids have the ability to increase estrogen levels due to the aromatase process, specifically the conversion of testosterone to estrogen. This can lead to gynecomastia and water retention. Excess water retention can also promote high blood pressure when it becomes severe. Steroids that do not carry a strong estrogenic nature can also cause these effects, most notably gynecomastia if they carry a progestin nature. A prime example would be Nandrolone, which while it aromatizes only does so at 20% the rate of testosterone. However, it also carries a strong progestin nature, and progesterone has been well noted for carrying the ability to stimulate the estrogenic mechanism in the mammary tissue. By administering Aromasin during the use of anabolic steroids, this will inhibit the aromatase process, lower estrogen levels and protect the individual from estrogenic side effects. How effective is Aromasin? The product claims on average to have the ability to lower serum estrogen levels by 85%.